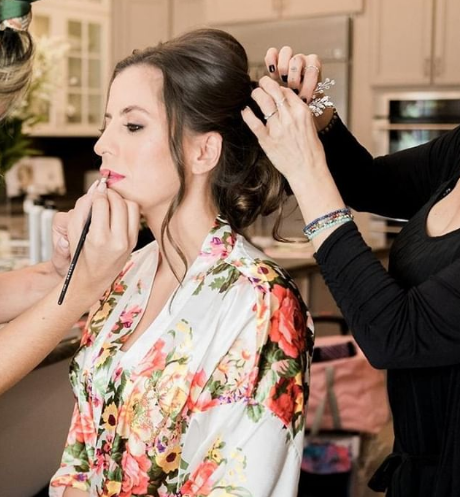 Planning a wedding can be both a blissful and stressful event, surrounding yourself with pro’s can help reduce that stress so today we’ll be talking about how to work with a professional makeup artist for your wedding (or any grand occasion). Just like choosing the right photographer, florist or caterer choosing the right artist for you can require some research like reading plenty of reviews and interviewing to make the right connection that fits both your needs and your personality. Here are some questions to help get you started on the right path. What details about my wedding should I share with a Makeup Artist? EVERYTHING! The more information the better, is it an indoor or outdoor event? Is it an ultra glam venue or a simple backyard celebration? Is it an afternoon or evening affair? All of things matter when planning your look so the more information you share the better. Can I tell a Makeup Artist what I like or do I have to just let them have creative liberty? Yes! Please do tell us what you like but more importantly tell us what you DO NOT like. Sharing both your likes and dislikes opens the conversation when it comes to choosing the right colors and products for you and your desired look. It’s especially important to let us know if you have any allergies or special needs that will need to be addressed, such as rosacea or any other skin conditions, this helps us plan in advance to ensure the artist has the right items in their kit for your appointment. Absolutely! We LOVE selfies that show the genuine you! We’d much prefer to see photos of you that you like, that make you feel radiant and confident as opposed to photo-shopped models from Pinterest. How can I get the most out of my makeup trial? When should I start looking for my makeup artist? You should book your Makeup Artist as soon as you establish your ceremony time and your first look with your photographer. This allows us to create your timeline before your activities begin. Here’s three of our most recent reviews from brides on The Knot. Meg and her team were amazing from day one. Answering all of my questions and offering lots of tips and information. My makeup looked flawless into the wee hours of the morning and my hair survived 20-30 mph winds without needing any touch up. Absolutely amazing! Megan and her staff have been BEYOND amazing through the whole process from booking to the finishing touches of making sure every detail was just what I wanted to feel confident on my wedding day. My now husband said I took his breath away. He likes a lighter hand with makeup and I like a more dramatic look and MUinthe702 struck the perfect balance. Thank you thank you thank you! Ready to get gorgeous? Book Makeup In The 702 TODAY! In all seriousness and honesty we’d love to be a part of your very special day. Please take a moment and click here to be directed to our contact page. Simply fill out the very short form and submit and get he conversation started.